In January, I had the pleasure of visiting a friend and her family who had recently moved to the San Bernardino National Forest. She and I were headed to a regional training the day after. The night I arrived, it was windy and cold. Thankfully no snow because I don't own any snow chains and the climb to the top of the mountain was steep and long! The weather held off until the day after our meeting... whew! The night I arrived, she was making a lentil soup. It tasted great! It was a hearty soup for a cold night. YUM! 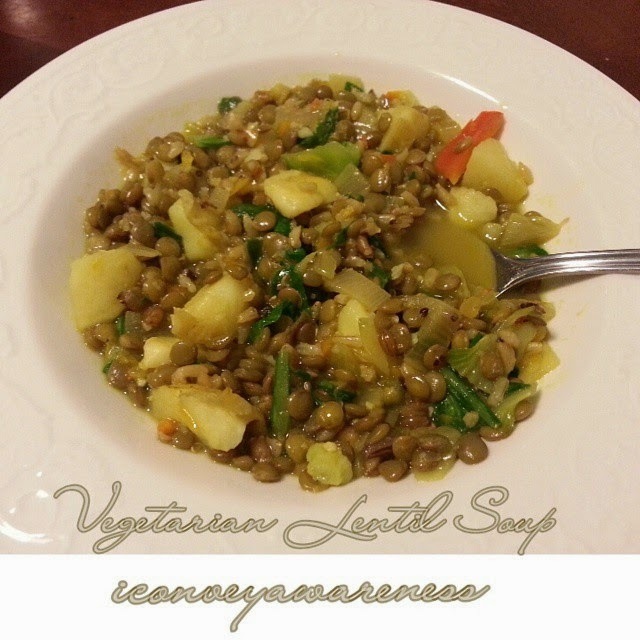 Recently, I thought about making some lentil soup. First, I must admit, I'm not a huge fan of lentils and many beans because of their texture, and because of this, I made sure to thoroughly rinse the lentils before and after cooking and before incorporating them into the final dish. Without further adieu, here is the recipe! 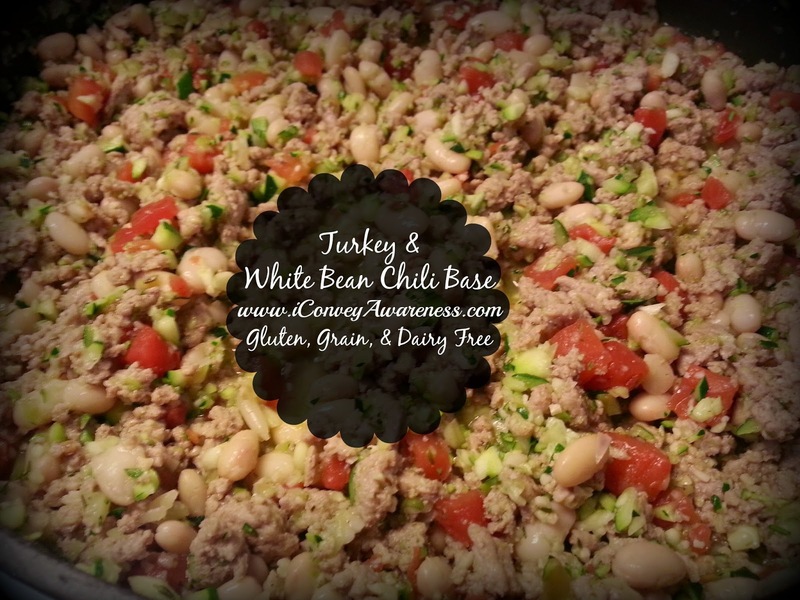 The recipe is gluten-free and dairy-free but not grain free, due to the lentils (legumes / grains) and the optional rice. Sometimes throwing something together just works. Ever have that happen to you on a regular basis in the kitchen? I'm happy to report that this is happening to me far more frequently and that's great for my family because the meals are coming out YUM-O! 1. 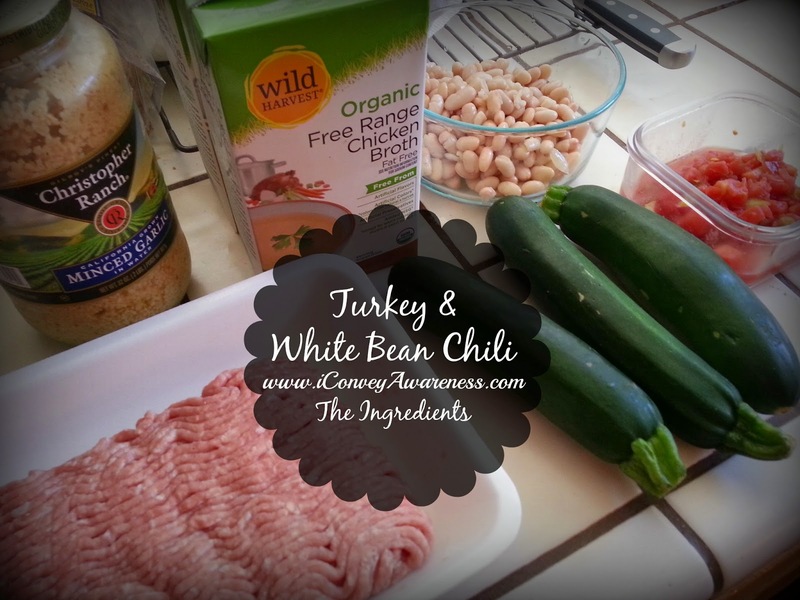 Brown the ground turkey and season it with salt, cumin, and oregano. 2. While turkey is cooking, prepare the zucchini. Note 2: You can use any food processor or if your knife skills are up to par, you'll dice the zucchini by hand. I use this (it's the mini) but when I have a large batch without paying attention to random sizes, I use this. 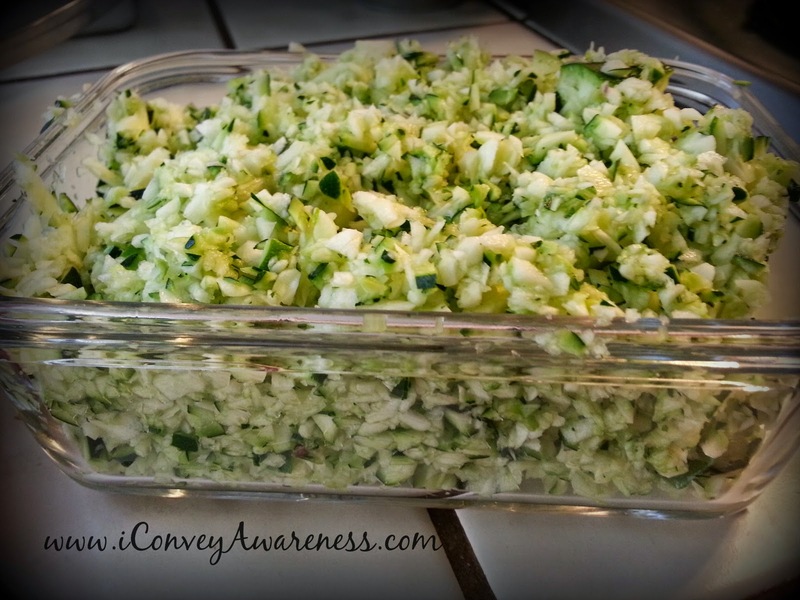 After chopping zucchini, use a mesh bag and remove most of the water content. 3. Add the garlic to the turkey and cook for a couple minutes before adding the zucchini. 4. Cook zucchini for 3-5 minutes. 5. Add tomatoes with chilies and rinsed beans. Stir. Cook for 2 minutes. 6. Add the broth and cook on high. Stir as needed. 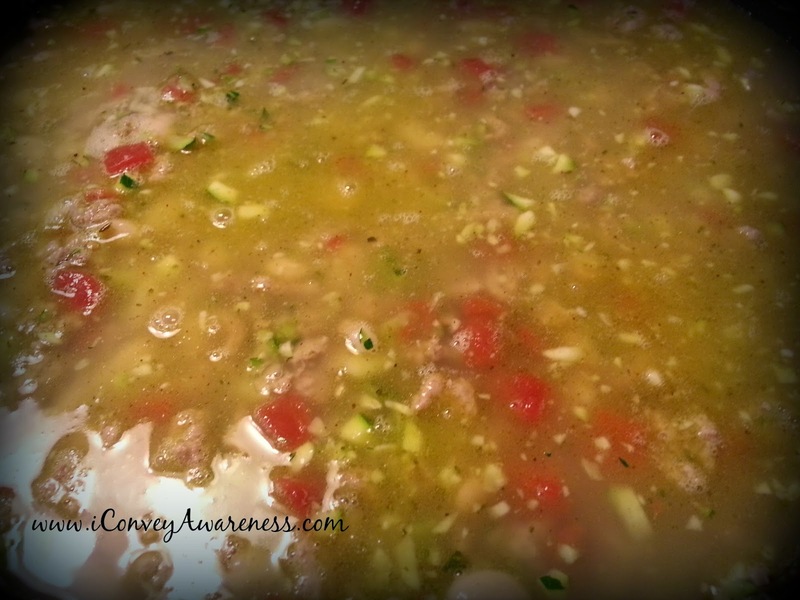 When it comes to a boil, turn down the heat to medium and partially cover the chili allowing the broth to reduce. 7. If you want there to be some broth left, cook for 25-30 minutes. Cook longer (about 45-55 minutes) if you'd like no broth to remain. Stir as needed. 8. While broth is reducing, prepare your red onions and set aside. This will be your topping before serving. The chili has hints of kick and the onions lighten the heat a bit. My husband likes to add rice to the chili for added filling and satisfaction. 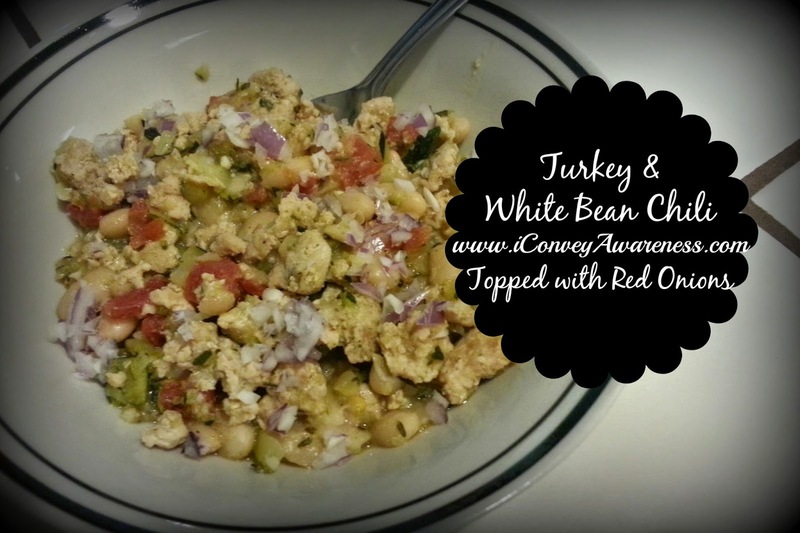 I think the turkey & white bean chili tastes great on its own. You decide. Make it and let me know what you think it needs or if it is just right. So, let's have some muffins for breakfast! Sure, we can do that! Only if the ingredients are known, wholesome, and nutrient dense though or it wouldn't be as guilt-free, right? Well, I'm sticking to that story at least. Join me? Today I'm sharing two new muffin recipes and a couple links to others I've shared in the past. Feel free to comment below with your favorite breakfast muffin. 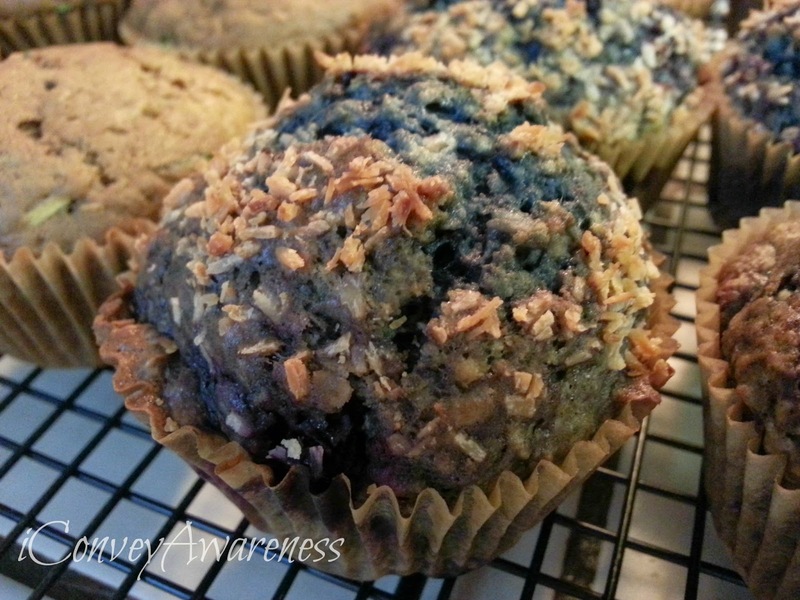 BTW, the two whole food muffin recipes below are dairy-free! My mom has a dark green thumb. She has always grown with much success house plants and over the last several years she has had a garden with abundant fruits and veggies. I don't have the pleasure of living near her but we talk about what's she growing and I used to think that I couldn't do that either until I got involved as a volunteer in the community garden. Since May of 2014, I've been learning how to garden as a volunteer at the Ridgecrest Community Garden. A year ago, I killed lavender in a hanging basket. But today, I'm growing (with the help of other volunteers) organic veggies in.the.desert!! 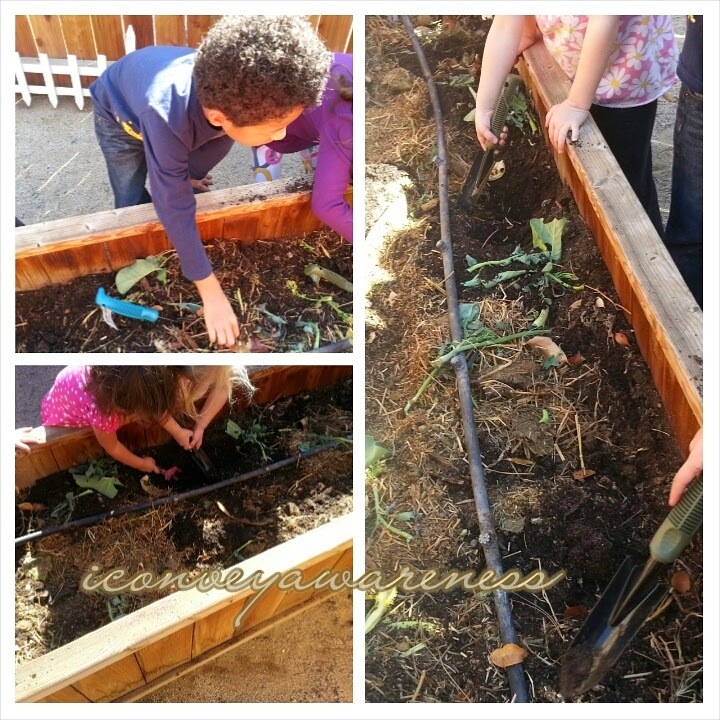 Last month, the director of my son's Montessori school asked me to take the lead on their spring garden. I informed them that I'm just starting but one of the teachers suggested me since I'm into nutrition and that I also advocate for families to eat more fruits and vegetables. 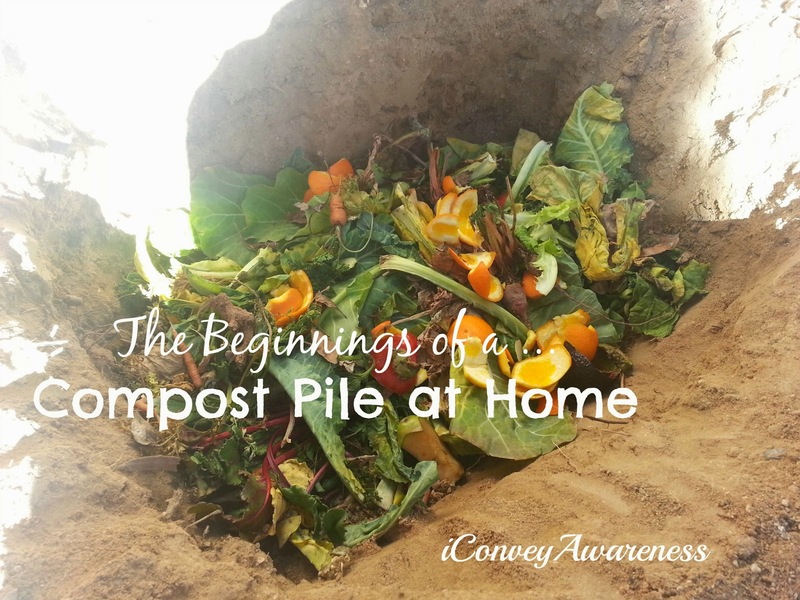 The same week that the school asked me to volunteer, my husband said yes to a compost pile in our yard just a day before the school's request. I love how things work out naturally. 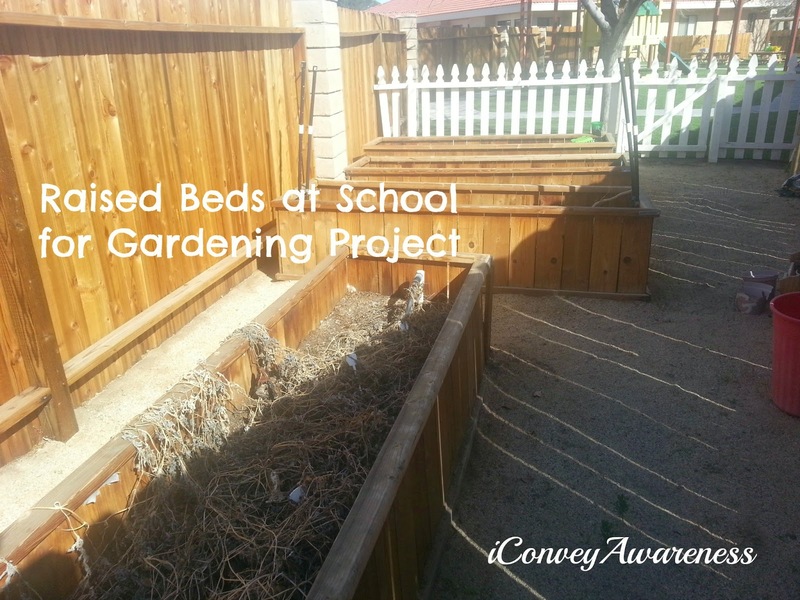 The school was given 4 raised beds 5'x3' and one of the beds we made into the compost pile because it already had the fruits that didn't make it last spring decomposing. There are over 100 children at the Montesssori school so I've created a curriculum of sorts to get all the kids involved in this growing season. I will blog about the project in the coming months. So why all this attention on growing in the soil when there's also an option to own a system that requires no soil? Well, knowing how to avoid toxic chemicals while growing food is essential and growing potatoes and other root veggies in the ground needs enriched soil from untainted sources. And, since I have a brown thumb background, I feel building the soil proves to be more work albeit fruitful, it is more than owning and growing food on a Tower Garden - not only no soil but it also has proven to yield more fruits and vegetables (Univ of Mississippi). Plus, it's an honor to be chosen at my son's school for this project and I get more opportunities to work with the children cultivating a love of real food! Another reason I'm growing food in soil to start, is that I want to get more hands-on experience - plus, it's a great excuse to play in the dirt like these kids! Perhaps your school will be interested in some Tower Gardens moving forward or maybe you?! We can set up a GoFundMe account and coordinate your school efforts together. Place your new order here for a vertical gardening system with organic produce that can be grown indoors and outside.